Bangalore: Due to the shortage of water and rain in and around Bangalore, many farmers in surrounding districts like in Malur have had to look for water sources in the contaminated and toxic wastewater from Bangalore in order to irrigate their farmland. Many farmers’ fields in Malur have been affected by the little rain that has further reduced in previous years in this area. In addition, many farmers and local people admit that every year summer has been getting hotter and worst and have had to find other alternatives to have water on their land and to maintain their crops. They also suffered the drought of the river Borewells and this has resulted in widespread diseases. 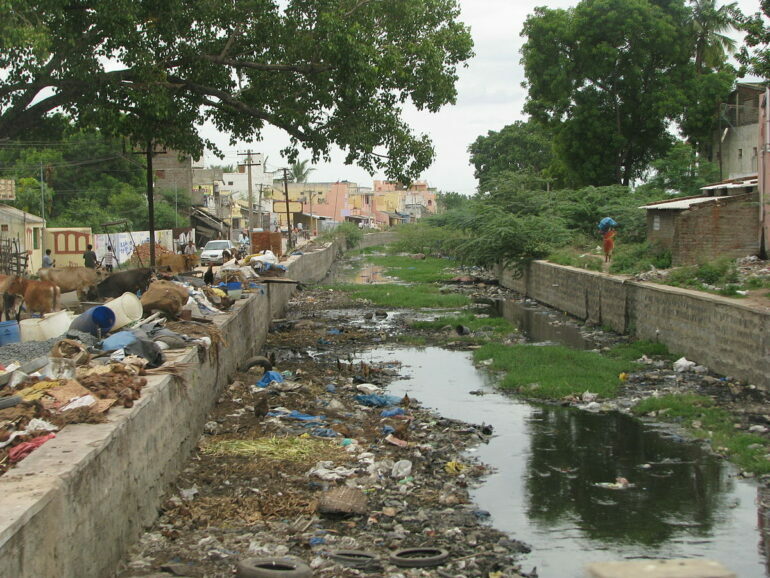 This wastewater, or sewage, is served directly from Bangalores Netkal reservoir, through pipelines running through the city from Varthur to Tamil Nadu, passing through other nearby towns such as Jagadenahalli, Kottur, Mugalur, and Belkere. To keep their crops hydrated, farmers have had to extract water directly from this toxic sewage with the help of engines and pumps that allow them to extract water from the sewers. In fact, farmers are already aware that it is impossible for them to get water directly to Cauvery or Bangalore, however, they take advantage of the Cauvery pipes to solve the water shortage a little and raise the water level in the farm land. For several years it was thought to apply this type of solutions for farmers and other nearby lands, there was already the proposal that farmers use this channel to provide their crops with water. However, it was not until the shortage came and the real need to realize the need they had. In addition, the proposal was for the pipes to reach some tanks located in the vicinity of the city, but there was disagreement between politicians and the work was not carried out as it should have been, but however a large amount of money was spent on projects to supply the water to Bangalore and surrounding farm lands using pipes or sewers. The project started very well, however, it was forced to stop and the proposal was forgotten. Only 11 km of pipes were installed to allow wastewater to flow to a tank in Lakkur from a wastewater channel located in Mugalur. Meanwhile, the tanks have been in the constant process of elaboration and assembly, but many have already lost the hope that these projects will be ever finished. In spite of all the problems that have perished in this part, the citizens and farmers have lost hope with the government to give them a solution. Many of them are also forced use nearby contaminated water, and further administration and police wont allow them to extract water from anywhere else. Meanwhile, the people of surrounding farm lands have continued to use their pumps and motors to extract ground water and thus maintain their fields and crops, since, for many of them, this is their main source of water. They don’t expect the government to take any action on the matter immediately and solve this problem. If you’re looking to local politicians for practical solutions regarding water supply, let alone pollution and traffic, forget it . These boys are about the money, period . Their concern for the environment and public welfare extends as far as their monetary interests .